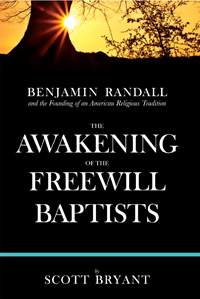 In the last decades of the eighteenth century, Benjamin Randall (1749–1808) was one of the principle founders of the Freewill Baptist movement in colonial New England. Randall was one of the many eighteenth-century colonists that enjoyed a conversion experience as a result of the revival ministry of George Whitefield. His newfound spiritual zeal prompted him to examine the scriptures on his own, and he began to question the practice of infant baptism. Randall completed his separation from the Congregational church of his youth when he contacted a Baptist congregation and submitted himself for baptism. When Randall was introduced to the Baptists in New England, he was made aware that his theology, including God’s universal love and universal grace, was at odds with Calvin’s doctrine of election that was affirmed by the other Baptists. Randall began to preach revival services throughout the region and he established a new congregation in New Durham, New Hampshire, in 1780. The congregation in New Durham served as his base of operation as he led revival services throughout New Hampshire and Southern Maine. Randall’s travels introduced him to many colonists who accepted his message of universal love and universal grace and a movement was born as he formed many congregations throughout the region. Randall spent the remainder of his life organizing, guiding, and leading the Freewill Baptists as they developed into a religious tradition that included thousands of adherents spread throughout New England and into Canada.